Have you discovered this book? From these histories we can draw some startling conclusions. For example, from the mid to late 1920s, a period when many consider that the Carmel art colony had reached its apogee, eight artists, who are recognized today as outstanding figures, can be confirmed as preeminent based on the frequency of exhibitions outside the Monterey Peninsula and the degree of critical acclaim during their lifetimes: E. Charlton Fortune, Arthur Hill Gilbert, Armin Hansen, Joseph Mora, Mary DeNeale Morgan, John O’Shea, William Ritschel and William Silva. However, the same contemporary sources indicate that ten other Carmel exhibitors were quite exceptional and given equal if not more attention in the press: Roberta Balfour, Margaret Bruton, Ferdinand Burgdorff, Jennie V. Cannon, Gene Kloss, Edith Maguire, Clayton S. Price, J. Blanding Sloan, William C. Watts and Stanley H. Wood. Likewise, in the first Berkeley art colony Edwin Deakin, William Keith and Xavier Martinez are today viewed as “the celebrities,” but critics and the public between 1906 and 1911 held in the greatest esteem nine other Berkeley artists: Henry J. Breuer, Louise Carpenter, Charles M. Crocker, Carl Dahlgren, Jules Mersfelder, Perham Nahl, Charles P. Neilson, Eda Smitten and Elizabeth Strong. For my own research on Anne Bremer, this book has provided references to specific articles in sources like the Carmel Pine Cone and Berkeley Courier that I might never have tracked down. So if you want to learn in depth about any artist of Carmel or Berkeley prior to about 1950, be sure to check this resource! There are just two more weekends left of my exhibit at the Berkeley Historical Society. The official closing day is Saturday, April 2, but it will also be open on Sunday, the 3rd, 2-4 p.m., for a talk by Aleta George about her biography of poet Ina Coolbrith (who, by the way, was one of Albert Bender’s many friends; the Bender Papers at Mills College contain 85 letters she wrote him beginning in 1917).
. . . though the University of California had no art gallery, with faith in the future and an eagerness to provide the material for a great art gallery, which he saw one day coming, he gave us paintings, marbles, and other works of art, even though he realized that for a time some would have to be stored and others serve merely to embellish the previously austere offices of the President and myself. The latest incarnation of that dream opened as the Berkeley Art Museum and Pacific Film Archive where the campus meets downtown Berkeley on January 31, 2016. I’m curating an exhibit for the Berkeley Historical Society, to run October 11, 2015–April 2, 2016, called “Art Capital of the West”: Real and Imagined Art Museums and Galleries in Berkeley. It was Jennie V. Cannon, an artist, who visited Berkeley in 1907 and wrote in her daybook, “I could not believe my eyes—there were artist groups and displays everywhere—so many fine artists that this place surpasses San Francisco as the art capital of the West.” As Berkeley town and gown look forward to the opening of the new Berkeley Art Museum and Pacific Film Archive this winter, the exhibit will look back over more than 130 years of hopes, dreams, successes and setbacks. Who knew that there was a Berkeley Art Museum back in the 1920s? That UC Berkeley’s third building, after North and South Halls, was built as an art gallery as well as the campus library? You may know about the “Old Art Gallery” at Cal, a brick building behind Sproul Hall that had been a power and steam plant before it became a gallery in 1934 with the help of art professor Eugen Neuhaus and art patron Albert Bender. The exhibit will feature the rocky history of the dream for a major university art museum that dates back to the generosity of Phoebe Apperson Hearst in the 1890s and early 1900s but took a long time to come to fruition. I’ll also try to cover private and non-profit galleries, including the ACCI Gallery, Ames Gallery, Berkeley Art Center, Judah Magnes Museum, Kala Art Institute Gallery, and any others that come to my attention as having existed up to 25 years ago. Please let me know if you have relevant material to lend, other ideas, or would like to receive an invitation to the show. Gertrude Stein and her brother Leo are well known for being pioneering collectors and promoters of modern French art in the early 20th century while living in Paris. Another brother, Michael, and his wife Sarah also lived in Paris, became collectors, and brought paintings back home to San Francisco. Some of these paintings are now owned by the San Francisco Museum of Modern Art (SFMOMA). Michael was the eldest of five siblings, and it was his shrewd business management of the family’s assets that enabled the others to live comfortably and begin collecting art. Fellow San Francisco art aficionados Anne Bremer and Albert Bender knew the Stein family and were no doubt influenced by their adventurous attitudes toward modern art. The Fauve (“wild beast”) movement got its name from a critic’s comment on some of the more radical, intensely colored paintings in the 1905 Salon d’Automne. 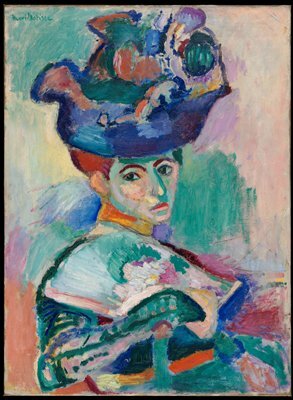 One painting that was especially ridiculed by visitors and the press was Matisse’s Woman with a Hat, now in the SFMOMA collection. One of the Steins (it’s not entirely clear who) bought the painting, and Leo and Gertrude each later bragged that they had been the first to recognize Matisse’s genius. But according to Matisse himself, “Mme. Michael Stein was the really intelligently sensitive member of the family.” She certainly became one of his most ardent early supporters and patrons, as well as studying painting with him in the Académie Matisse, which she helped establish in 1908, and keeping detailed notes of his statements about art. The Steins in the courtyard of 27 rue de Fleurus, ca. 1905. From left, Leo Stein, Allan Stein, Gertrude Stein, Theresa Ehrman, Sarah Stein, and Michael Stein. resumed her pivotal role in the lives of her California women friends, a group of unmarried, artistic, German-Jewish women of at least middle-class status. These women had long envied Sally her marriage and motherhood; now their friend was also privy to glamorous Parisian ways. She urged them to visit France. Among her frequent visitors was Harriet Levy, now an aspiring writer and the drama critic for The Wave, a local weekly; Annette Rosenshine, an art student; and Alice B. Toklas, Annette’s cousin and Harriet’s O’Farrell Street neighbor. I am so very sorry, my dear Miss Toklas that I can not have the pleasure of lunching with you, but I leave on Saturday, or if I fail to get done, on Sunday, for Venice. In about a week I go on to Paris where I hope to see you a little later. My address will be care of Cook and Son, and for the first I expect to go to the American Art Students Club. Also surviving in the Gertrude Stein papers is a note from Anne after their return to Paris inviting “Miss Toklas” and “Miss Stein” to tea at her apartment, 115 rue Notre Dame de Champs. Anne must have made at least one pilgrimage to the rue de Fleurus apartment occupied by Gertrude, Leo and Alice, as did so many other American artists in the pre-war years. Anne was, of course, better acquainted with Sarah and Michael Stein, whom she may have seen soon after arriving in Paris. But Sarah’s father was seriously ill, and on July 16 they left for San Francisco, and they did not return to Paris until about the time Anne left in September 1911. Visitors to the Gertrude Stein home, often dropping in during Saturday night salons, came away with a variety of impressions. Artist Anne Goldthwaite described her first visit there, in 1906: after walking past a concierge’s “cage” and “across a little pebbled court we went into a beautiful large studio filled with antique Italian furniture. The walls were covered with the most remarkable pictures I had ever seen. I knew that they must be pictures because they were framed and hanging on the wall.” She found Gertrude “a brilliant talker,” witty, and saying she knew nothing about painting: “I only quote my brothers, Mike and Leo.” On the other hand, she never again saw Gertrude in quite such a cheerful, talkative mood. During my Paris year I came to feel a real sympathy for Leo Stein and genuine respect for his artistic judgment. But I was hampered in my relations with Leo because I conceived an immediate antipathy for his sister Gertrude. . . . Most of the visitors to the Stein apartment in 1909 paid little attention to Gertrude. The center of attraction was Leo’s brilliant conversation on modern French art and the remarkable collection mostly of contemporary paintings which he made at little cost with the aid of his independent and exacting judgment. Leo was cruelly shut off from easy communication with others by his inner conflicts. But his extreme sensitivity, introspection and overly severe self-criticism aroused sympathy rather than aversion. When we looked at his collection together, he spoke little, but his occasional words and the intensity of his feeling revealed the modern paintings one saw with him in their highest significance. was shaped and draped like a Hindu idol. She was not the sphinx I expected but a very gracious and charming hostess and had a tinkling, humorous laugh that one would never forget. . . . I had not come, as most people had, to meet Miss Stein but to see their collection of modern painting. Painters who were at that time considered the wild men of Paris (Fauves) lined the walls of her studio: Matisse, Picasso and others. Cezanne, Renoir, and El Greco hung with these present day wild men. . . The room was filled with Americans drinking in Gertrude’s charm and modern French art. The young man who brought me there was a Stein enthusiast . . . He invited me, a few evenings later, to see a collection of Matisse that was housed in the residence of Michael Stein. Sarah wrote to Gertrude from San Francisco on October 15, 1910, “Mr. Bender has been very nice to us. He leaves in a few weeks to join Anne Bremer. Do your best for him.” There is no proof of his visiting rue de Fleurus, but he and Anne probably did so together. During this visit he may have even bought some of the modern French prints that he later donated to SFMOMA. Albert would have had another chance to encounter Gertrude Stein when she visited San Francisco for eleven days in 1935, her first return to the U.S. after many years abroad. They had many literary friends and acquaintances in common, and if nothing else he would probably have attended her lecture at Mills College, where he was a Trustee. He would not have been pleased to hear that she had declined to meet Robinson Jeffers while she was in Carmel enroute to San Francisco, because he was a great friend and patron of Jeffers. But at the same time Gertrude and Alice were in San Francisco, Albert was immersed in the opening of the city’s museum of primarily modern art, featuring art he had donated. So the seeds planted by the Stein family’s early enthusiasm for modern art had germinated in San Francisco for close to three decades, nurtured by Anne Bremer, Albert Bender, and a handful of others, and finally blossomed under museum director Grace McCann Morley. 2. Sadly, Sarah Stein sold most of her pioneering modern art collection during the Depression to fuel her grandson Daniel’s passion for racehorses. Through the efforts of Elise Haas and others, the San Francisco Museum of Modern Art now owns twelve works by Matisse and Picasso from the Stein collection, and reassembled many more of the hundreds of works collected by the Stein family for an exhibition in 2011. 3. San Francisco Chronicle, 17 September 1922, p. D4. 4. Sarah Stein to Gertrude Stein, 8 October 1906, Gertrude Stein Papers, Beinecke Library, Yale University. The “woman with the green nose” was probably The Green Line, now in the Statens Museum for Kunst, Copenhagen. 5. Linda Wagner-Martin, “Favored Strangers”: Gertrude Stein and Her Family (New Brunswick, N.J.: Rutgers University Press, 1995), p. 81. 6. Anne Bremer to Alice Toklas, undated, Gertrude Stein Papers, Beinecke Library, Yale University, box 97, folder 1830. 7.. Anne Bremer to Alice Toklas, undated, Gertrude Stein Papers, loc. cit. 8. Adelyn Dohme Breeskin, Anne Goldthwaite (Montgomery, Ala.: Montgomery Museum of Fine Arts, 1982), pp. 23-24. 9. Agnes E. Meyer, Out of These Roots (New York: Arno Press, 1980), p. 81. 10. Letter from Edward Fisk, circa 1931, to his sister-in-law Spalding Young, quoted in Rachael Sadinsky, “Edward Fisk: A Modern Life,” from Edward Fisk: American Modernist (Lexington: University of Kentucky Art Museum, 1998). 11. Sarah Stein to Gertrude Stein, 15 October 1910, Gertrude Stein Papers, box 126, folder 2730. For several years I have been researching and writing about late-19th-century and early-20th-century California art, architecture, museums and patronage. My major long-term project is a dual biography tentatively titled Kissing Cousins, AMB and AMB: The Artistic Lives of San Francisco’s Albert M. Bender and Anne M. Bremer. Meanwhile, I would like to introduce you to these two remarkable people who had a major impact on the Bay Area cultural landscape. Anne Bremer (1868-1923) was a highly regarded San Francisco-based artist, noteworthy for her interest in modernism and experimentation, especially after she studied in New York and Paris in 1910-1911. She held a number of leadership roles in the Bay Area art community. Her career was cut tragically short by leukemia. Albert Bender (1866-1941) was her cousin and beloved life partner. A successful insurance broker, he became a major patron of artists, museums, libraries, and performing arts organizations. Through Anne’s influence, he was particularly open to modernism, and he helped establish what are now the San Francisco Museum of Modern Art and Mills College Art Museum. To read more, click on “About Albert Bender” and “About Anne Bremer” at the top of this page.